Edward Eggleston was born in Vevay, Indiana, USA. He was an American historian and novelist. 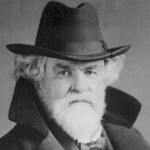 He wrote a number of tales, some of which, especially the "Hoosier" series, attracted much attention. Among these are The Hoosier Schoolmaster, The Hoosier Schoolboy, The End of the World, The Faith Doctor, and Queer Stories for Boys and Girls. His other novels include The Mystery of Metropolisville, The Circuit Rider: A Tale of the Heroic Age, Roxy, and The Graysons. His Beginners of a Nation and Transit of Civilization from England to America contributed to the growth of social history.